All transactions are safe and secure with a reliable history in online purchasing behind each of our associates. 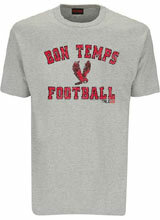 Buy the Bon Temps Football t-shirt to own True Blood clothing and merchandise. Jason Stackhouse (Ryan Kwanten) has the most exciting story in The Southern Vampire Mysteries books by Charlaine Harris. From a Bon Temps football stand out, to a V addicted ladies man accused of murder, to an enlightened member of the Fellowship of the Sun, and then an exemplary student at the Light of Day Institute, it has been one wild ride. He has been the dream man for Tara Thornton (Rutina Wesley), even when she was with Sam Merlotte (Sam Trammell). If Jason Stackhouse is number one in your heart too, then this is the True Blood tee for you. Pair it with a Merlotte's t-shirt. In addition to the Bon Temps Football tee above, browse the True Blood Clothing Gallery for more apparel like men's and women's clothes, kids shirts or hoodies.